On a sunny winter afternoon in Exeter, N.H., the fading daylight illuminates blues and greens in the new stained-glass window of the Phillips Churs. The colors give the window a three-dimensional effect as they swirl into a dramatic red that bursts across the 15-by-20-foot piece. How to get food stamps to the people who need them? Massachusetts, with its liberal reputation, is the third worst in the country at getting the message out, with only 40 percent of qualifying people getting food stamps, according to a federal study. That's why a Web site, gettingfoodstamps.org, moved into Spanish last month. Download a PDF to read the full text of the article. "If you wish to have any standing in society," wrote French novelist Stendhal in 1832, "it is necessary that 20 people should be interested in speaking well of you. Remember you will get promotions only by means of the salons." The Laconda Room in the Prudential Center's Marché restaurant doesn't exactly bring a 19th-century French drawing room - from which the salon tradition drew its name - to mind. To poet Maggie Dietz, Franklin Park is a haunted place, the kind of place she haunts for her muse, from the abandoned bear pits to a neglected 1912 stone facade. Download a PDF to read the full text. Copies of "Wuthering Heights" and "Othello" recently began a lengthy journey, along with "Essentials of Internal Medicine" and "Principles of Economics." They are among 9,000 books from Boston and Cambridge bound for Afghanista, via Belgium, Uzbekistan, and bumpy rides across the Afghan border. The 91-degree August morning doesn't alter Rafael Torres's energy level. Squinting in the bright sun, he calls out, "Yours in Spanish?" while offering brochures to Boston Harbor Tourists." "I love doing tours," he said. "If I have 40 people it's even better." The 51-year-old native of Colombia developed an interest in tourism after 20 years of working for organizations such as La Alianza Hispana and the YMCA. He started asking local tour companies if they wanted a biligual guide, but, "They weren't interested," he said. "We did this to claim back this park," said David Ramos, parent support coordinator of the Hyde Square Task Force and organizer of the second annual "Evenings in Mozart Park" series every Thursday in August. Download a PDF of the print article. "I love their pants," said Greg Burk, referring to the suits worn by Mariachi Mexamerica band members. "I want to get a pair." Two things haven't changed in the 40 years since the Jamaica Theatre became a supermarket. One is the '60s-style storefront, which overlooks a sloping parking lot. The other is Bill Jordan. 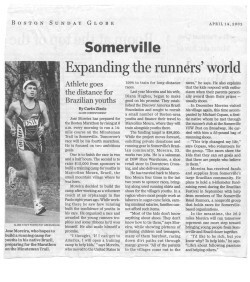 Jose Moreira has prepared for the Boston Marathon by rising at 6 a.m. every morning to run a 14-mile course on the Minuteman Trail in Somerville. Tomorrow's race will be his fourth marathon. He is focused on two ambitious goals. One is to finish the race in two and a half hours. The second is to raise $15,000 from sponsors to build a training camp for youths in Marcolino Moura, Brazil, the small mountain village where he was born. Moreira decided to build the camp after working as a volunteer coach at an orphanage in São Paulo eight years ago. While working there he saw how running built the confidence of youths in his care. He organized a race and awarded the young runners trophies and some ribbons he'd won himself. He also made himself a promise. "Pupusas are the fast food of choice." "it's a long ride. In four hours a lot can happen," says drive P. Tineo, who says passengers have met boyfriends and girlfriends during the trip. "They get on at different houses and don't know each other. The next time you see them, they're riding the bus together." Download a PDF of this article published in The Boston Globe.